It's fun experimenting with plants in pots and assorted containers. Even watering the pots can become an enjoyable summertime experience, even if they need it twice a day. 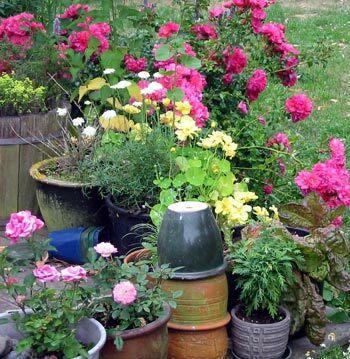 And flower-filled pots are just perfect for brightening up a gap in the garden. Sensible, thoughtful gardeners might keep tender plants in pots, to quickly shift them out of the winter frost. Pots make great gifts, too, especially if they're already filled with potting mix and some exciting new plants. I often start my favourite foliage plants off in pots, and then transplant them into a proper garden space. Many of my Phormiums and Cordylines now established in real dirt started life in pots on the house decking. It's a great excuse to buy new ones! On a recent wild and unrestrained garden pot spending spree I found a couple of big brown pots with handles and spouts. They were tea-pots, and fifty percent off the marked price. Of course as a tea-drinker I had to grab them both! Finally, after years of neglect, I have some new patio pots - and just because the Garden Club ladies are visiting the Moosey Garden! I've gone for last decade's 'daring' (my new pots are angular and blue) with pretty flowers and strong foliage. The purchasing and placing of Garden Art requires an imaginative mind and eye - I'm not sure that I have either! But I do have the wallet, the trailer, and a large enough country garden. I dislike my big gum tree in February - it sheds leaves and bark all over the house lawn. But I love the collection of foliage plants in pots which form a ring around its base. It had to happen - I finally succumbed - I bit the bullet - I bought a replacement Cordyline Albertii (the super stylish variegated Cabbage Tree, usually spied in pairs of hugely expensive pots on townhouse patios). The year was 2004. I love the nursery plant sales. I love peeping at the Bargain Table, picking out shrubs I like, trying out new varieties. As a compulsive recycler, my favourite plan is to use the new plants in groups of containers - then plant them out the following year. A gorgeous dark coloured Aeonium was one of my original container treasures, proudly purchased it from a mail order nursery. I broke the original plant into pieces and replanted the bits into a new blue pot. Miniature roses are perfect to show off in a pot. This one was a present from one of my non-gardening friends. I think of her every day in summer as I'm watering it. Nasturtiums are the cheapest and easiest plants to grow. They won't last for ever in a pot, but I save their seed for next time. One winter I decided to become acquainted with succulents. I thought I would grow succulents in pots close to the house, so they could be out of the reach of frost. Out came a mail order succulent catalogue, and in went my order for a collection of sedums. Over winter my garden sleeps underneath a blanket coloured drab green and brown. There's not usually any snow, by the way. The few colours out there are difficult to spot. Lots of polyanthus plants in pots are the answer! And the trick is to put them where they'll be noticed.